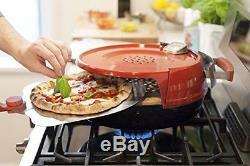 Pizzeria Stovetop Pizza Oven, Home Dorm College Cooking RV Apt Condo Baking NEW. 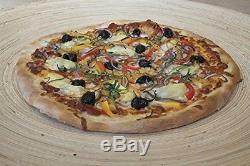 Cook Delicious Pizzas On Your Gas Stovetop, Perfect for Pizza Night with Family and Friends. Oven Preheats in 15 Minutes, Cooks a Pizza in 6 Minutes, Inside of Oven Reaches 600 F, Much Higher than a Conventional Oven. Measures 14.3 by 16.9 by 6.7 Inches and Weighs 14.7 Pounds. Fits Most But Not All Gas Stovetops, Please Make Sure Stovetop Oven Is Compatible With Your Stove, Further Details Below. If you've ever dreamed of transforming your kitchen into a pizzeria, the Pizzeria Pronto Stovetop Pizza Oven can help you get the hot, fresh pizza you love. Most conventional ovens can only achieve temperatures of 500 F and require up to an hour to reach those heats. The Stovetop Pizza Oven can heat up to 600 F in about 15 minutes, allowing you to cook your pizza in as little as 6 minutes. 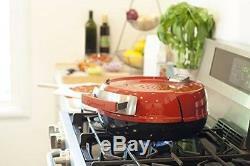 The Stovetop Pizza Oven uses one of your stovetop's gas burners to reach cooking temperature. Simply place the oven on top of your burner and turn it on. The oven's heat-efficient design traps and reflects heat to create the optimal pizza-cooking environment. Dual cordierite baking stones absorb the direct heat from the flame and redistribute it evenly, eliminating hot spots. The stones are separated by a layer of air to diffuse heat, and the bottom stone has a cutout for improved airflow. The built-in thermometer lets you know when it's time to cook, and the moisture vent in the top prevents your pizza from becoming soggy. With the Pizzeria Pronto Stovetop Pizza Oven, you can get pizzeria-perfect pizza in your own home. HOW TO USE: Assemble your oven as instructed in the manual (about 15 minutes). Place the oven on top of your gas stovetop burner, making sure the opening on the bottom of the oven (which exposes the bottom cordierite stone) is centered above the burner. Turn your burner to high and allow to preheat for 15 minutes with the door shut. Remove the door and place your pizza on the stone using a pizza peel. Replace the door and allow to cook for about 3 minutes. Remove the door and use your peel to extract the pizza and then rotate it 180, then replace the oven and shut the door. Allow to cook another 3 minutes and remove. PLEASE NOTE: Your stove top needs to have gas burners. 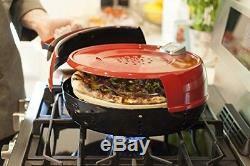 The Stovetop Pizza Oven will not work with an electric range. Can be used on burners with lower BTU, but preheat time may be longer. PLEASE NOTE: The Stovetop Pizza Oven will reach 600F during cooking. 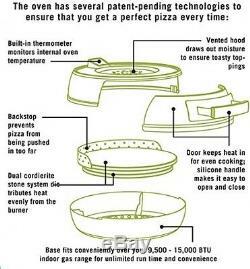 Please keep this in mind when determining whether the Stovetop Pizza Oven is compatible with your stove top. The Stovetop Pizza Oven should fit directly over one of your burners without covering or coming too close to materials that could be damaged by high heat such as plastic knobs or counter tops made of heat-sensitive materials. Built-in ranges featuring knobs on top of the range directly next to burners are not compatible with the Stovetop Pizza Oven. We do not recommend purchasing the Stovetop Pizza Oven if your range has dial knobs near your burners or if your range is directly next to a countertop that can not withstand some heat. PLEASE NOTE: Many types of peels will work with the Stovetop Oven. This peel will make it easier to transfer pies in and out of your oven. CAUTION: Oven will become very hot. Allow to cool before cleaning and storing. Taken for granted as they are mostly inaccurate and misleading as reported by our previous customers. As this may be due to weather or logistical issues. If it takes any longer than that, please. This will allow us to resolve your issues in a timely manner. Our stock all ships from our US-based warehouses which are located throughout the US. Of the product and we do NOT offer any extended return options. We guarantee you only the best experience when shopping with us! 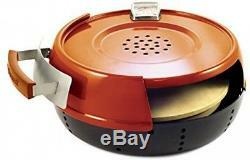 The item "Pizzeria Stovetop Pizza Oven, Home Dorm College Cooking RV Apt Condo Baking NEW" is in sale since Thursday, September 8, 2016. This item is in the category "Home & Garden\Kitchen, Dining & Bar\Bakeware". The seller is "*alcam0*" and is located in Portland, Oregon. This item can be shipped to United States.